Fall just might be my favorite cooking season for the mere fact that I can make PUMPKIN EVERYTHING!!! Sweet, savory....pumpkin is excellent both ways. My first recipe of this season is a first for me. I basically took the classic recipe for cinnamon rolls and added pumpkin puree and pumpkin spice to the dough. And if you though Cinnabon was your jam...wait till you try these! Start with the dough first as it takes the longest. Warm the milk but not too hot to touch then pour into a bowl and add the yeast. Let yeast and milk sit for about 8 minutes. Meanwhile, mix flour, white sugar, spices and salt in a large bowl till well mixed. In a separate bowl, mix the milk/yeast mix, brown sugar, melted butter, pumpkin puree, egg till well combined. Now, combine both wet and dry mixtures in one big bowl and knead by hand or use dough hook attachment for about 5 minutes. Place dough ball into a greased bowl, cover with plastic wrap and allow to rise for an hour. 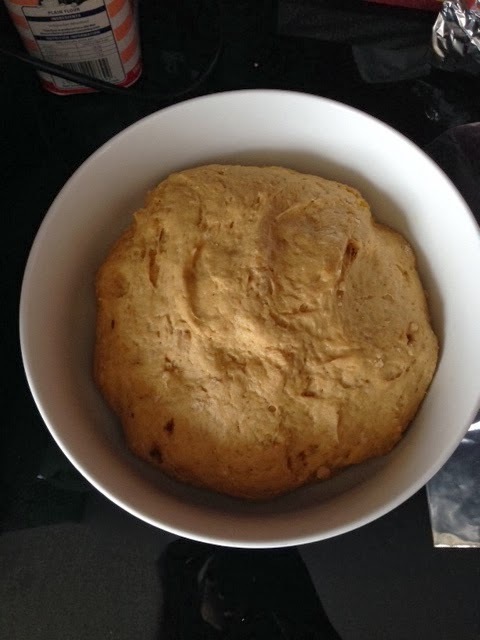 On a well floured surface, roll out the risen dough into a large rectangle. For the filling, first spread the melted butter evenly over the entire top of the dough. Then in a small bowl, combine the pecans, brown and white sugars, spices, and salt. Sprinkle this mixture evenly over the buttered dough and pat down lightly once finished. Now here's the fun/tricky part....take the short edge of the rectangle and begin to roll(like in the photo). Go very slowly to make sure the dough doesn't rip underneath. Once completely rolled, use a sharp knife to cut about 1 inch slices. Place slices into a buttered baking dish. It's ok if they are touching. Once rolls are all cut and placed into the baking dish, let rise again for about 30 minutes more before putting into the oven at 350 degrees for 20 minutes or till golden brown on top. While they're baking you'll want to make the icing. Just mix the cream cheese and powdered sugar by hand for a few minutes then add the milk and vanilla and beat till smooth and creamy. Once you remove the rolls from the oven, use a butter knife or spatula to spread the icing over the tops while the rolls are still hot. Let cool slightly before shoving them into your mouth!